“Way of the Cross,” a 45- to 50-minute street drama depicting Christ’s final hours, has quickly become a Good Friday tradition in Bridgewater. This year, five churches collaborate April 19: Church of the Living Christ, Bridgewater Presbyterian, Bridgewater United Methodist, St. John-Wayman A.M.E., all in Bridgewater, and North Way Christian Community, Beaver Valley, in Rochester. There will be practice at the Bridgewater Presbyterian Church on Tuesday, April 16, 6:30 p.m. All participants in the Way of the Cross should report by 10:30 a.m. on Good Friday. Listen to what Pastor Dave has to say. Click Below. The board meeting will be on Monday, March 25, at 7:00 p.m. here at the church. Enjoy recent selections of services that have been preached from the pulpit of CLC. Enjoy selected teachings, guest speakers, and current events. 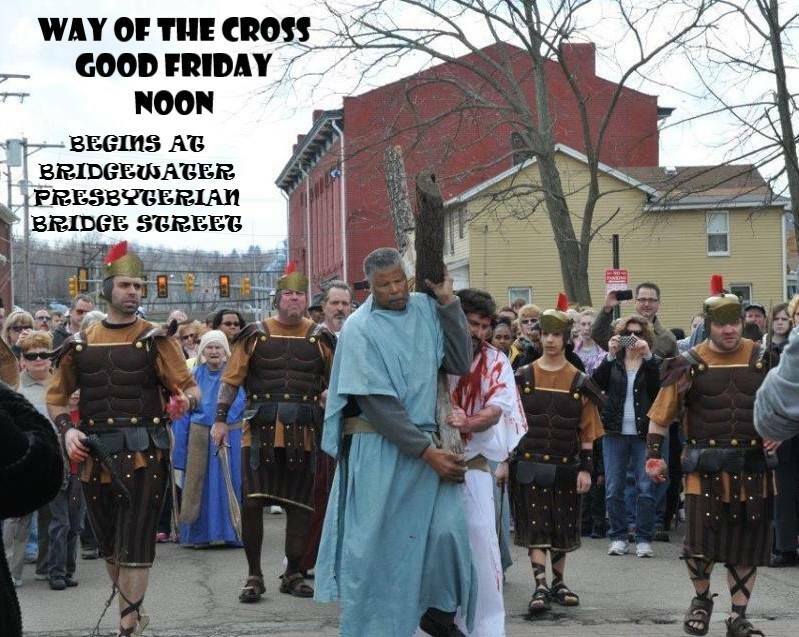 Beaver County Churches come together to present a live reenactment of the Crucifixion of Christ. 12:00 NOON GOOD FRIDAY, APRIL 19th.